When Arianna finds herself face-to-face with the gorgeous castle blacksmith, Craig James, she feels such an intense connection to the man that she is left stunned, unsure what the hell is happening to her. He's not just remarkably handsome, he also possesses an irresistible charm, that leaves her powerless to resist him. Abandoned by his mother as a young boy, and taken in by the elders of the Redwater clan, Tegan isn't your typical hero. In fact, if you ask him, he wouldn't call himself a hero at all. Tegan may be half dragon, half human, but he's all heart. If he doesn't stay focused on the mission at hand, he will find that the curvy woman he's determined to protect, could be on her way to stealing it. 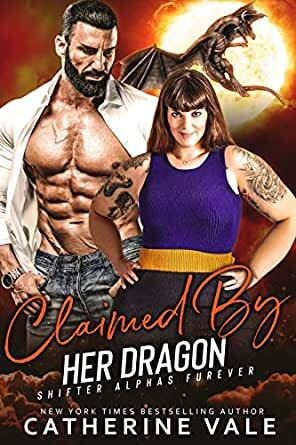 When the curvy dragon shifter suddenly loses her ability to fly and finds herself hurtling to the ground, Adalyn must admit, she's one hot mess. Unable to escape the city without wings, she goes on the warpath to find out exactly who is responsible for her inability to shift. A few hours later, she finds herself drowning her sorrows at the local watering hole. What's a girl to do when she has nowhere to go, and no one to call for help? She falls into bed with the sexiest man in town, of course. Except the guy isn't exactly able to help considering his reckless behavior is the reason why she can’t leave. the Stories in this anthology are well written and imaginative. I don’t particularly care for time travel type Scottish romances, so did not find the second book, Kiss of Fire, all that interesting, however the other books made up for it. I especially liked Dragons mark, with the strong female heroine. This is a lot of what I love best about shifter and paranormal romance. There’s magic and intrigue, action and love. It’s a gripping story that kept me entertained and left me desperately flipping pages to see how Kane and Luna would win in the end. I liked the instant connection between Kane and Luna, but I appreciated even more that we got to see how their relationship developed. I loved that Luna was so fierce and independent and yet was able to listen to and accept the suggestions Kane made. I especially enjoyed watching Kane develop from simple mercenary into someone of greater honor with a nobility capable of standing as alpha. Scottish clansmen, dragons, witches, and magic? How did you know these were key to making me a very happy reader? The story of Arianna and her blacksmith intrigued me from the beginning. Add in the witches and curses and evil magic, and I was hooked. There was no way I could put the book down until I knew how it would turn out. I don’t know if this story was meant to be funny, but in my cynical and jaded advanced age, these two youngsters made me laugh. Tegan and Ciara are a little Romeo and Juliette. I’d say ‘without all the fighting and dying’, but that’s in here too. Same goes for all the family drama. The plot is a little obvious and felt a bit heavy-handed at times, but the layer of cheese made me laugh and that allows me to forgive a lot. I was hoping that this would continue the plot from the second book in the Order of Protection series, but the fact that it doesn’t, might partially explain the name change. Even though it doesn’t continue the fight against the group Justice, this has all the action, drama, and intrigue of the previous book. Adalyn and Christian make an interesting pairing. Very much the good girl and the bad boy, but those opposite traits mean that they perfectly compliment each other as they’re outracing assassins as they criss-cross the country. I received a complimentary copy of this book through Booksprout. 5.0 out of 5 starsHOT Dragon romances!!! Dragon's Mark - Who are Dane and Kane? Who is Alex? Who is Arcus? Why is Alec talking to Kane about him? Who is Luna? What do we learn very quickly about her? What do we learn about Kane and Luna? We learn about Kane's past with his Clan and who he is within the clan. We see Luna fight alongside Kane when it is needed. Read and see what happens. Kiss of Fire - Who and what is Arianna? Why does she travel to Scotland? Who are Craig, Ross, Bridget, and Ravena? What is the history of Castle Nathair? What is Arianna working on? Where is she from? Who is Hectora and what does she have to do with all of this? What happens with Arianna and Craig? Read and see. Shades of Dragon - Who is Tegan? Where is he from? What do we find him doing? Who is Grey? How does he come across Tigan? What happens? What does Grey do when he finds out Tegan's story? Who is Ciara? What has happened in her village? Who is behind it? Where does Tegan go for help when the caravan is spotted? Enjoy! Dragon Heat - Who is Adalyn Shaw and where is she? Where is she from? I could not stop laughing when something unexpected happens to her. Who is Christian Malone? What do we learn about him? Who is Delila and where does she find Adalyn? What does Delilah has Adalyn to do in order to get her mojo back? Read and see. Such a fun read! Four well written Dragon shifter stories that I enjoyed reading the stories flowed smoothly from page to page. This is the fourth book in the Shifter Alphas Furever series. the stories are Dragon’s Mark = Kane and Luna there is suspense, drama, danger, evil, villains, murder, and romance. Kiss of Fire = Arianna and castle blacksmith, Craig James' story. Shades of Dragon = Ciara and Tegan a story I enjoyed. Dragon Heat = Adalyn and Christian and baby Mason have to get from one place to another and outrun assassins. I enjoyed reading all the stories. I received a copy of this book and am voluntarily leaving a review. 5.0 out of 5 starsScorching hot! Another great paranormal collection by Catherine Vale. This one features dragon-shifters and it's HOT!!! Action-packed, full of adventure and fast-paced, there' not a dull moment reading them. Lots and lots of chemistry between the heroes and heroins and wonderful plots to keep you glued to your favorite ereader screen!!! Fans of shifter/paranormal romance will definitely enjoy this collection. 4.0 out of 5 starsFantastic Collection! Enjoyable reads. I want to read the other collection sets. Ms. Vale has done an excellent job wielding these four tales of adventure, commitment, loyalty, romance and love. All the characters are likeable and the story lines flow easily. I enjoyed reading about Kane and Luna, Ariana and Craig, Tegan adn Ciara and Adalyn and Christian. All the couples although opposite in some instances are absolutely complimentary to each other. Well done Ms Vale! I received an ARC from Booksprout for a review.